A highly flavored tender annual herb that is used in many dishes. Sweet basil can reach 2-3 feet tall. It attracts butterflies and beneficial insects to the garden. Plant Requirements: There are many different varieties of basil such as lemon basil, cinnamon basil, sweet basil and more. The best way to find variety is to shop for seeds. I have noticed a few lesser-known varieties of seeds in the stores, but you will find more variety through specialty seed catalogs. Basil likes well-drained soil that is rich in nutrients. It also likes full sun and lots of water. Basil also likes warm weather and will not do well if the weather turns cold. Propagation: You can start seeds early indoors 6-8 weeks before the last frost or take cuttings. Germination of seeds takes at least 2 weeks. Directly seeding outdoors after frost has passed and soil has warmed will also do well. Planting: Plant Basil in the garden after all danger of frost has passed and temperatures are consistently 60*F or more. Space plants about 12 inches apart. Care: Slugs and snails love Basil so you’ll need to protect your plants from them. You can crush eggshells and put a ring of them around the base of each plant or put a ring of gravel. Pinch back often to encourage bushy growth. Using Basil: Harvest just before flowering or while flowering. You can also pick leaves as needed anytime. In the Garden: Basil can be grown in containers or in the garden as an ornamental plant. Grow purple leaved varieties next to the green leaved varieties for a beautiful contrast. Companion Planting: Basil is said to improve the growth and flavor of asparagus, tomatoes and most vegetables except cabbage and snap beans and is said to repel whiteflies. It is also a great companion to roses by improving their growth and providing some protection from insects. Culinary: There a many different ways to use basil in the kitchen. The purple or red varieties make beautiful herb vinegars. Lemon basil is a great addition to fruit salads or to use when cooking poultry. Lemon or cinnamon basil can be used in jellies, honeys, vinegars and baked goods. Sweet basil is excellent with Italian dishes such as spaghetti. Crafts: Use lemon or cinnamon basil in potpourri. Basil is symbolic for best wishes and warm friendship; this could be taken into account if you are making an arrangement for a special occasion. Basil can be dried and used in herb/dried flower wreaths. Repel Insects: Rub basil leaves on your skin or grow in a container near a troubled area to repel insects such as mosquitoes. You can also burn sprigs of basil on the barbecue or fire to repel them. Place fresh sprigs over bowls of food to prevent flies from landing. As you can see, basil is a very useful, decorative and valuable herb that is well worth the minimal effort to grow. I hope you’ll try it if you haven’t already. Harvesting Basil: Much of the flavor of basil is lost from the leaves once the plant has set seed, so the best time to harvest is after flower buds have formed but before the flowers actually open. One exception is if you are using the herb to make basil vinegar – in that case, pick some stalks with open flowers, as the white or purple blooms will add color and interest to the bottled vinegar. Preserving Basil: You can dry basil by hanging it in bunches upside down to air dry. However, a better method is to lie sprigs of basil in a single layer on racks or trays. Cover the basil with cheesecloth, then leave in a dry, airy spot out of the sun for a day or so. Store dried basil leaves in airtight jars or sealed plastic bags. Basil in the Kitchen: Use fresh or dried basil leaves in soups, stews, dips and sauces. 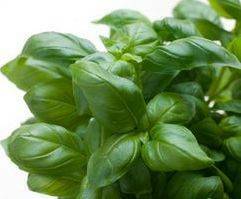 Basil is a wonderful addition to meat, fish, rice, pasta, cottage cheese and egg dishes. It is used as part of a fines herbes mixture and is common in Italian cuisine. Basil is excellent in red lentil soup, gazpacho, and to season tomato sauce, spaghetti sauce, tomato juice, dressings and sausage. Purple basil is used fresh in salads, and provides nice contrast color in flower arrangements. 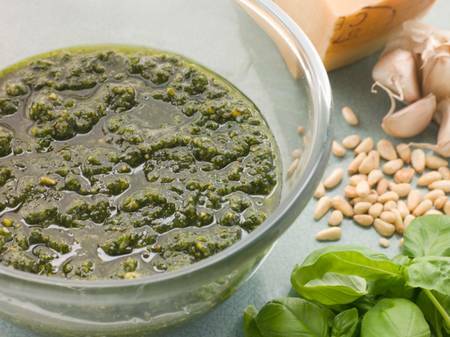 Basil is also the prime ingredient in this delicious recipe for Basil Pesto, in which it is blended with pine nuts, garlic, oil, and cheese. Mince together in the food processor: basil, parsley (if using), garlic and pine nuts. Add cheese and process to blend. Slowly drizzle in oil, processing to a moist paste. Remove to a small bowl and cover with plastic wrap pressed into the surface to prevent browning. Or pack pesto in a ziplock bag, remove the air, and store in refrigerator for up to one week. 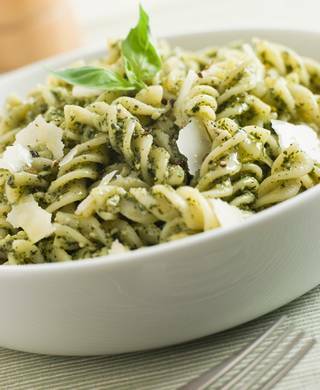 Pesto may be tossed on hot cooked pasta, mixed with equal parts sour cream to use as a dip, or used as a topping for a baked potato. Spread pesto on crackers or toast, or make bruschetta bread by rubbing bread with garlic, brushing with olive oil, topping with pesto and fresh diced tomatoes.